Bethel First Presbyterian Church is God’s family of Presbyterians in Campbellsville and Taylor County, Kentucky. The Bethel Presbyterian church dates back to 1799 when a group of Presbyterians who had migrated to Kentucky from Virginia, and finding themselves in a wilderness without a public place for furthering their religious beliefs, invited the Rev. Jeremiah Abell to supply them occasionally with preaching of the Word. He preached in private homes about once a month. Later Bethel Church was established with about twenty members. The church grew and flourished. Following the War Between the States, Bethel was part of Presbyterian Church, U.S. (Southern) until the merger of the U.S. and U.S.A. Churches in 1971. In 1884 thirty-four members of Bethel were dismissed to become charter members of Campbellsville Presbyterian Church in Campbellsville. A Sunday School had been meeting in town for several years prior to the establishment of the First Presbyterian church in Campbellsville, Kentucky. 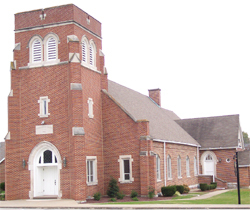 A big decision was made in 1966 to merge the Campbellsville Church with its mother church, Bethel, and this merger was completed in February, 1967. The church was to be called Bethel First Presbyterian Church. The Rev. Fred Reed, pastor of First Church, was called by the newly formed, merged church to be its pastor, which places he filled for the next fifteen years. Bethel First is a member of Mid-Kentucky Presbytery, and Synod of Living Waters. This church seeks to witness to the “Good New of Jesus Christ” in many forms of mission and ministry, proclaiming an Ancient Gospel to a Modern World. During Fred Reed’s tenure a fellowship hall was erected, with new Sunday School rooms, pastor’s study, secretary’s office, and kitchen. The church is governed by the Session which is composed of the minister (Moderator) and twelve elected Ruling Elders. The church was destroyed by fire in 1892, and rebuilt. It was almost destroyed by fire just 100 years later in August 1992. Since 1993 Thanksgiving Dinner has been shared with all persons in the community. We celebrated our 200th anniversary on July 4, 1999. God’s love through Christ brought us together and sustains us. The church bell calls us to worship every Sunday morning at eleven o’clock and has done so since 1984.